Have you ever heard of Carson County, Humboldt County, St. Mary's County, Grease Wood County, Cedar County, Rio Virgin County, or Shambip County in Utah? No?! That's because they no longer exist! 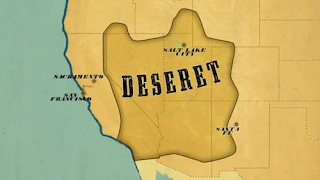 In 1850, there were only six counties in Utah, then known as the "State Of Deseret": Great Salt Lake, Weber, Tuilla (that's how they spelled Tooele back in 1850), Utah, San Pete and Little Salt Lake counties. You can read more about these "lost" counties, and why they disappeared, in a Deseret News article by Lynn Arave from July 17th 1989. Read up on it; you will learn a lot that you didn't know before! I was amazed at all the changes in counties over the years, and where these "lost" counties were located. The Southern part of Tooele County used to be called Shambip.